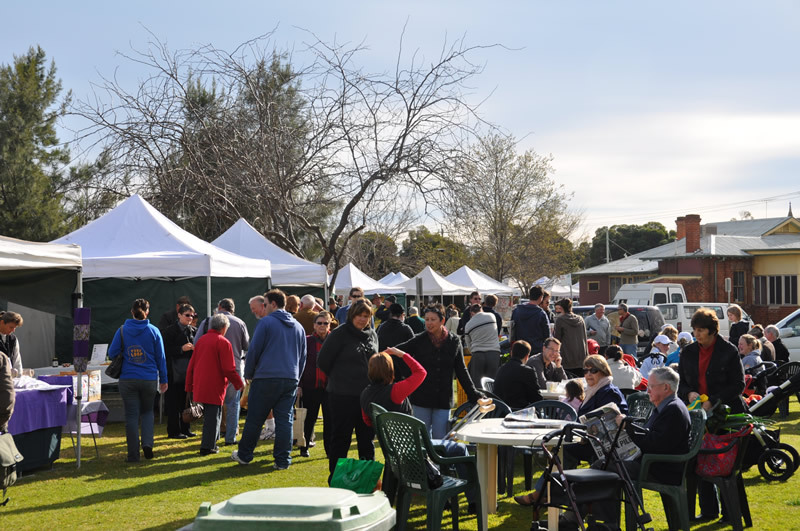 The Wagga farmers' market is a very social event. One cold day in January a couple of years ago, while Lisa was off at a conference (somewhere much warmer), Dan almost ran over a coyote on 119 Street in Edmonton, alongside the U of A farm. It was still dark, and it was snowing extremely hard, so hard that neither Dan or the coyote really knew exactly where they were. Both, however, were probably out foraging for food. We’re not sure what the coyote was looking for exactly, but Dan was on his way to the Old Strathcona Farmers’ Market. Because, almost every Saturday that we were in Edmonton, we went to the market. Cold, snow, rain, hangover, flu…nothing kept us away, even in winter when there wasn’t much there besides beets. We are market people. 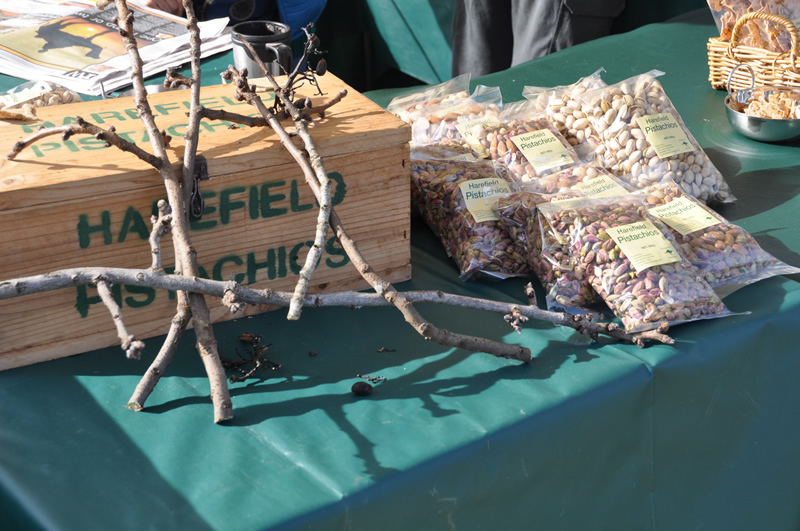 We like supporting local farmers, we like talking to them about what they are selling, and we like living seasonally (asparagus should only be eaten for 6 weeks, cherries and blueberries only in July…well, Edmonton’s July, at least). There were many types of potatoes available in Edmonton, but we don't recognize any of these varieties. Is it just that they call them by different names, or are they really different kinds? 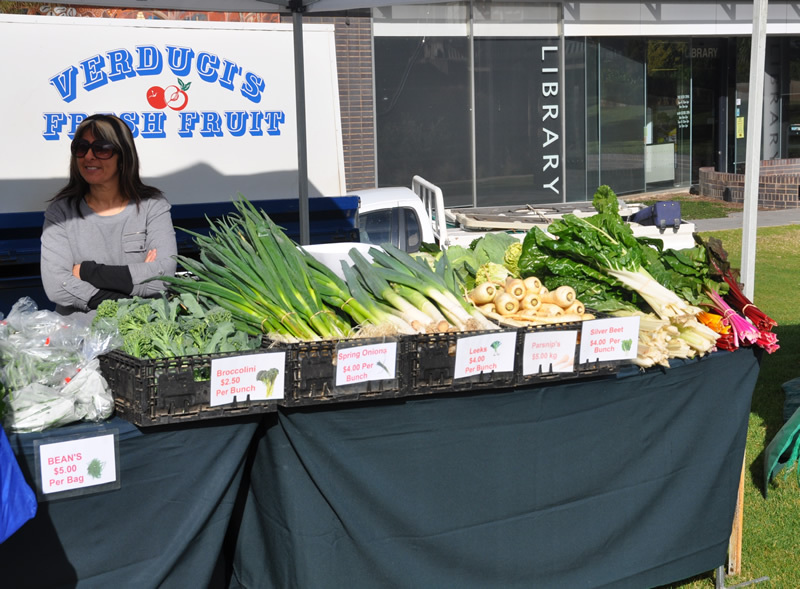 We’ve now experienced the Wagga farmers’ market twice. “Twice? Is that all?” you might ask. Yes, twice, because it is only held once a month. Yes, you read that right, only once a month. We went to the July market on the first weekend we were here. It was a cold and rainy day (for Wagga, and even we found it a bit uncomfortable), and not too many vendors were there. We were still jet-lagged, so it all just seems like a blur of a memory at this point. And we were living at The Lawson, so didn’t really have much need for a market, as we couldn’t cook. But we did buy some items that we could eat in our room, such as cheese, salami, bread, and wine. What more do you need, really? A huge variety of veggies, from what would seem to be different seasons, is available, from spring onions to root vegetables. This past Saturday, we went again. This time (jet lag behind us – yay! ), we have a place we can cook; we bought some veggies, fruit, and some meat, too. 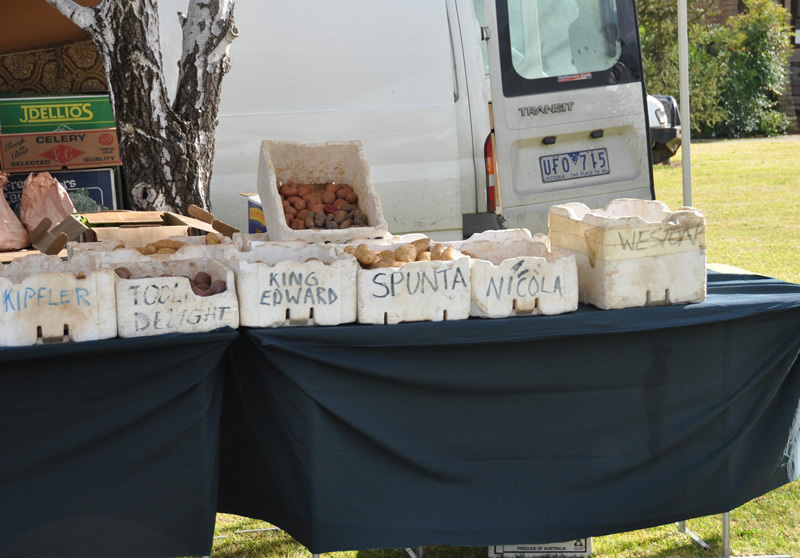 There were a few veggie vendors; we bought from one from a town called Leeton (about 90 minutes drive from Wagga), that had beans, cauliflower, kale, mandarins, rhubarb, parsnips… and this kind of confused us in terms of what season we’re in. This is winter, and that is a range of produce that would be fresh in Canada in summer and fall. So what we will get in summer here will be sure to be a treat. 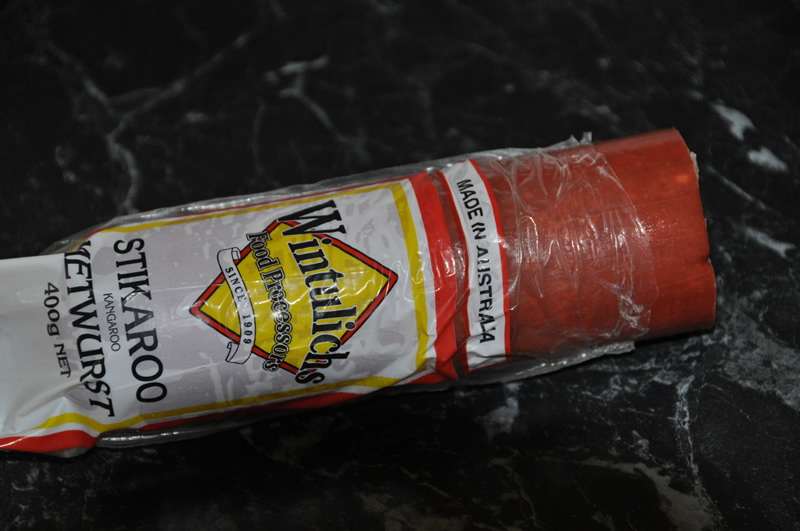 We also bought a Stikaroo – a cured mettwurst sausage made of kangaroo. It is delicious! And we bought a waygu beef salami too. At the waygu beef booth, from a farm in Victoria state, a couple of hours from here, we also bought a couple of amazing steaks and really yummy beef pie. It was a beefy weekend for us! And, keeping the Canadian connection alive, the guy who sold us the waygu beef was an economist-turned-farmer who had done his masters in Winnipeg at the U of Manitoba (of course! everyone here has been to Canada, knows someone in Canada, or wants to go to Canada). He understood why we wanted to abandon the cold for the southeastern Australia climate. We don't usually like flavoured cheese, and neither does Opa...the one named for him is a plain gouda. There is cheese available at the market too. An elderly couple from Boosey Creek, somewhere southwest of here, make an interesting array of cheeses. Our favourite is “Oma’s Favourite”, a gouda with cumin seed in it that is very subtlely flavoured and yummy! 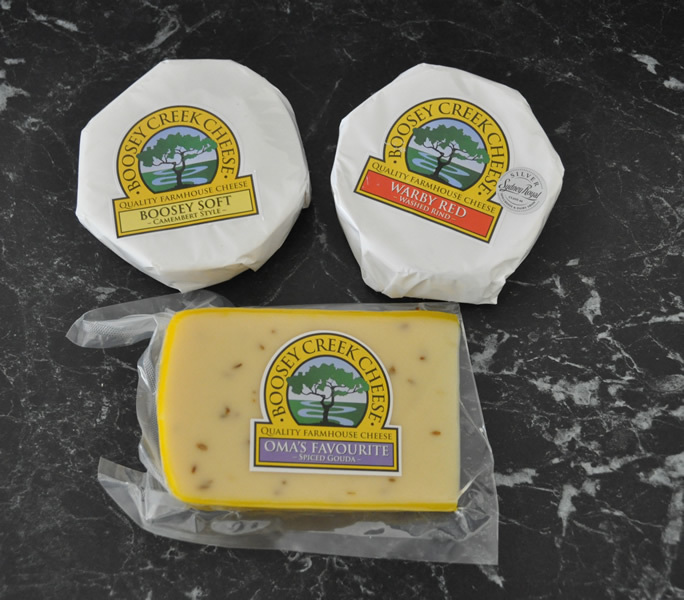 They also make great soft cheeses; the Warby Red is soft and stinky, the camembert-style one is firm yet creamy. We didn’t buy any of their blue this time, but will next month. The Charles Sturt University Cheese Factory also sells their cheese at the market. We didn’t buy any because we can get it any time on campus (for a discount! Lisa gets 25% off all wine and cheese. Now that’s a staff benefit!). The wines from Harefield Ridge are way better than the horrible fruit wines that were available at the Old Strathcona Farmers Market in Edmonton. CSU doesn’t bring its wines to the market, but there are wineries there. Borambola Winery is in Gundagai, 30 or so miles from here, and Harefield Ridge is just 10 or so miles outside of town. We didn’t buy any Borambola wines this time (we did last time) but brought home a few from Harefield. Their Cottontail cabernet sauvignon has a minty/eucalyptus undertone, spiced up by a bit of shiraz blended into it. It complemented the ‘bushmans spice blend’ (purchased at Knights Meats) on the waygu steaks, perfectly. Our favorite baker sells at the market too. Bernard is a french baker, living in Wagga and operating a business called, simply, Artisan Baker. Some days, his breads are available at Knights Meats, and on Thursday, Friday and Saturday he (and his wife, mother-in-law, daughter) also sells out of his own retail space (more of an industrial space…). It is a small operation, and his baguettes and other breads sell out quickly everywhere. When we got to the market, there were no baguettes available so we went to his shop…where they were open but only selling pastries because all the bread was at the market. We zoomed back to the market and managed to get the last loaf of pain levain. That was all there was, and it was only 10:30. There would be a lot of disappointed people over the next few hours until the market closed. We also got a loaf of carrot and poppy seed bread from Magpies Nest, a local restaurant that also grows grapes and olives and makes its own wines and oils and brings them to the market. The bread is spectacular; haven’t tried their wine or oil yet, but we will. We haven’t made it to the restaurant yet; Dan’s waiting for a special occasion (our anniversary, perhaps? If he can remember the date?). Pistachios taste good; so do the special pistachio bread crisps we purchased. Another treat we bought was some pistachios. These delightful nuts grow here in the Riverina, one of the many great things we had no idea grew here before we came (same with olives, mandarins, and limes). There are a couple of vendors selling them…we made the mistake of buying from the first one we saw, which turned out to be way more expensive than the second one. Oh well. Live and learn. So it was a good trip to the market, and we will be there again in September. And October. and November. You get the drift! How we will cope until then, we’re not sure. There are good fruit and vegetable markets and butchers in town, who sell some local products, so we don’t have to rely on the grocery chains, but it isn’t the same. We like buying from the source. We are thinking that we will have to start planning Saturday morning road trips to outlying towns like Junee or Gundagai or Narrandera, wherever else there might be a farmers’ market on Saturday or Sunday (Waggans – if you’re reading this – can you please post a comment and tell us where to go? Okay, not “back to Canada where you came from!”… but to markets that we might go to on our weekend excursions?). 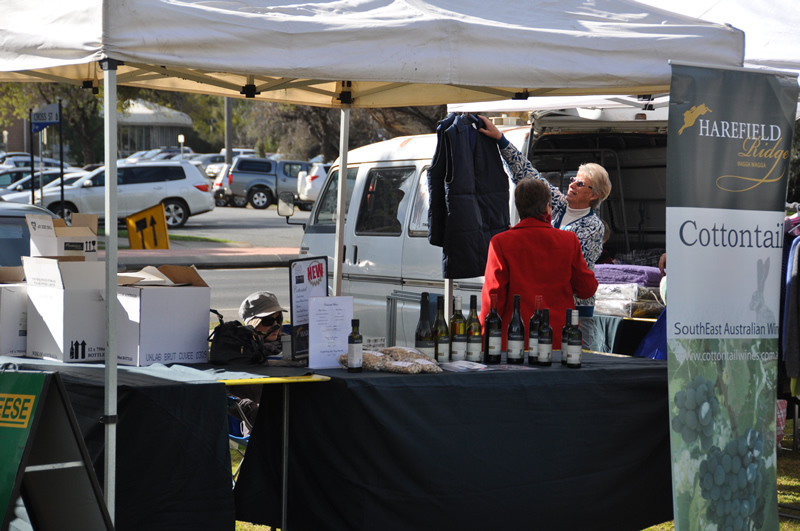 If we can do the Wagga market once a month, and maybe another one in the middle, that will be enough. This entry was posted in agriculture, beef, cheese, farmers market, food, kangaroo, market, pie, pistachios, sausage, vegetables, wine. Bookmark the permalink.